Here's a fun fact: the "snood" is actually, and I hate to mention this, "an erectile, fleshy protuberance attached near the base of a turkey's beak". I'd rather play with a turkey snood than a Game Boy Advance Snood any day! Now here's another fun fact: Snood is pretty darn popular. The Snood franchise has had a widespread effect across the globe, being used as a means of assisting terminally ill children and also keeping Apple co-founder Steve Wozniak off of Facebook at work. At its peak in 2001, over 1.5 million users were playing this darn game on their PC. And Snood still has its own website. It has its own Twitter account. It would probably have its own sandwich if people would just stop saying "I totally coughed up my Snood last night." 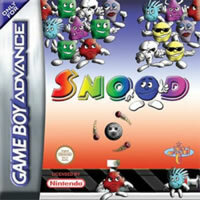 They're still cranking out Snood games for PC, Mac, and iOS, including the bile-inducing "Snoodoku". Not only is that a terrible name for a video game, but it also costs $19.99. Carol Vorderman must be spinning in her grave. ...What, she's not dead? Then what's she doing laying about in that filthy tomb? I'm not opposed to a game's success. It's nice that some guy named Dave in his basement created a fun gaming sensation that millions have enjoyed worldwide. No, I'm a bit more steamed that it's the exact same game as Puzzle Bobble (also known as Bust-A-Move in North America), just with, uh, more "snoods". I've already seen this game before, but it was more fun when Taito developed it. Dave is no Taito. As soon as I started up this game, I felt a twitch in my right eye. After a brief excursion to the local hospital, I determined that I was neither having a stroke, nor did a housefly decide to pull a swan dive into my iris. It was the awful music that blared from the speaker. This doesn't sound like a 32-bit, far superior Game Boy Advance soundtrack at all! This music was dumped straight out of any random European Game Boy Color title with its rolling, bubbly synths that sound like someone is drowning a pennywhistle in cod liver oil. The entire game is like this, filled with low-quality chiptune music. It's a bad sign when muting the game makes life better. Still waiting for Bub and Bob to saunter on-screen. I like how, on the options menu, you can "select character", as if it makes a significant difference on the gameplay. (It doesn't.) All the Snoods were designed, seemingly, by Kindergarten students. 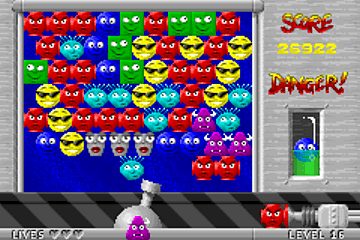 There's blue Jake, the all-around cool dude, er, I mean, Snood; Midoribe, a green square who's probably square; Spike, the angry purple triangle thing; Geji, a turquoise spiky menace; Numbskull, whose name implies what he is; Zod, the angry RED thing; Sunny, the upbeat yellow snood with 'tude; and Mildred, a gray old chainsmoking Snood whose facial expression is a clear indication that she'd rather be watching re-runs of Hollywood Squares from 1985 than participate in this game. 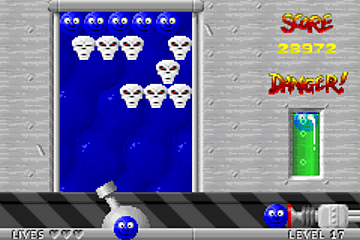 Then, before the first level, we get a shot at a Snood being pumped out of a machine, who then says "Ey, how ya doin'?" Not so good, Snood, not so good. 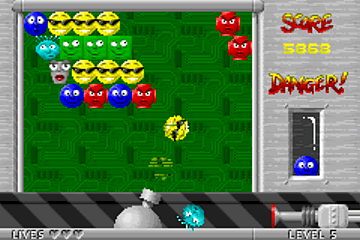 Just as in Bust-A-Move, you're presented with a series of levels, each a bit more treacherous than the last. Within the puzzle playing space, a bunch of different coloured snoods are arranged in some sort of coherent design. Your goal is to shoot different (and random) coloured snoods from a cannon at the bottom of the playing field to connect with others of the same colour. Matching 3 or more together makes them disappear; if others were hanging below, those get dropped, too. The level ends when all snoods are wiped out, and then you move on. I will argue one thing: compared to other games with the exact same premise, Snood's a bit more relaxed when it comes to actually getting your piece to fit where you want it. Though mistakes can still be made, I found that pieces do go where you actually intended more often in Snood. All in all, the game doesn't play terribly — it just plays derivatively. Now how in the heck am I going to get a blue snood up there to detach all the white ones? Nothing will get into that space, no matter what type of accelerator you think you can attach to your cannon. (No, there are no accelerators. Put that potential happiness away.) So I'm basically stuck right there, and that's how my game ends. Thanks, Snood. You're a real cool dude. I bet you wear muscle shirts, look at yourself in the mirror at the gym, and drive a souped-up Mustang. But underneath it all, you're just a frightened little lad who wants to fit in with the big boys. Snood is the puzzle game that wants to fit in, but with its lackluster presentation and overall rehashing of an idea already well explored, it's little more than "another game for Game Boy Advance". Snood's competent but dispensable.